Lancia Home has been in building since 1975 and the quality shows in our latest design called the Mandalay. This split Bedroom ranch home is located on a POND lot in Garrett, just 15 mins from the NW side business and shopping. This 3BDR, 2.5Bath, 3-Car Garage is a Smart home with an open concept plan that gives you access to the anyone in the Great Room while still cooking in the Kitchen. Off of Foyer is the Bonus Room or Den with French Doors and a closet. Foyer also has its own closet for guest coats. 9&apos; Great Room has fabulous view of Pond thru triple windows and includes a tray ceiling with crown moulding and ceiling fan. Stone gas fireplace is a great cozy place in the winter and has hook-up for tv above. Nook leads to 16x12 Patio. Kitchen has painted cabinets with larger island featuring a breakfast bar, granite counters, dual door pantry, smooth top range, stainless appliances, water softener bypass, gas line to range, upgraded faucet, dovetail drawers-soft close doors-drawers, taller cabinets, and larger crown on cabinets. Separate Utility room off Garage with dual door closet for more winter gear. The Master Bedroom has a tray ceiling and view of the Pond. Dual sinks, 5&apos; shower and ceramic tile flooring in Master Bath. Closet Tamers dual rod & shelf 1-wall unit in Master walk-in closet. Bedroom 3 also has view of Pond. Plenty of storage in this home with attic access from pull-down stairs in Garage with 2 sheets of OSB board. Home has NEW Simplx Smart Home Technology - Control panel, up to 4 door sensors, motion, thermostat CT-32, LED bulbs throughout, Andersen windows, 2-panel doors and 4 port USB built-in charger. Upgraded bath faucets and accessories. Upgraded vinyl plank flooring in Kitchen, Nook, Foyer, Hall, Main Bath and Utility Room. 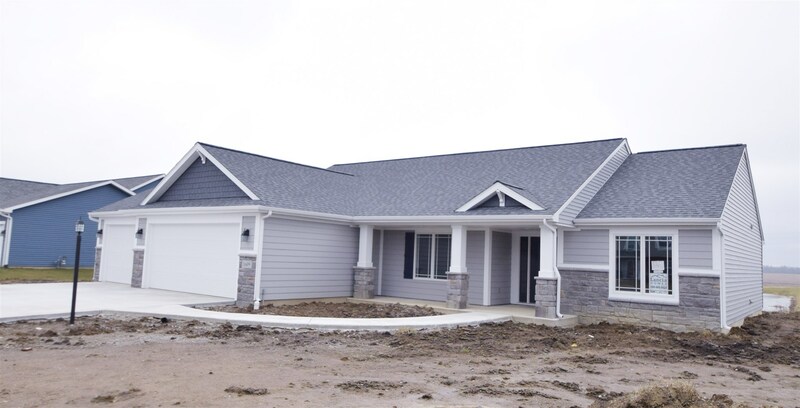 Curb appeal is shown on exterior with corbels, stone, dimensional shingles, and vinyl shakes. Full front porch with Craftsman columns. This is one of the FINAL lots in Countryside Estates, has the bonus of a POND behind and a extra green common easement on the north side.